What is the influence of graffiti on urban degeneration or regeneration? New York in the 1970s was suffering from an economic decline, a heroin epidemic and a massive boom in graffiti/street art. In Melbourne the 1990s urban redevelopment preceded a massive boom in graffiti/street art. The simple claim that graffiti is an indicator of crime and urban decay has to be challenged. If we compare the experience of graffiti in New York and Melbourne we can’t be sure that graffiti/street art is symptomatic of anything. In Kabul (Afganistan) and Misrata (Libya) street-art is shown as a sign of the city’s regeneration. The University Observer writes about street art’s contribution to Dublin. Sightline Daily has a photo essay about the regeneration of urban lanes in Seattle, Vancouver, San Francisco and Melbourne by Alyse Nelson. Even in law and order Singapore street-art has found an odd place in the city even aiding in the regeneration of Haji Lane, a street with old traditional style shops. (See my post on Singapore Street Art). 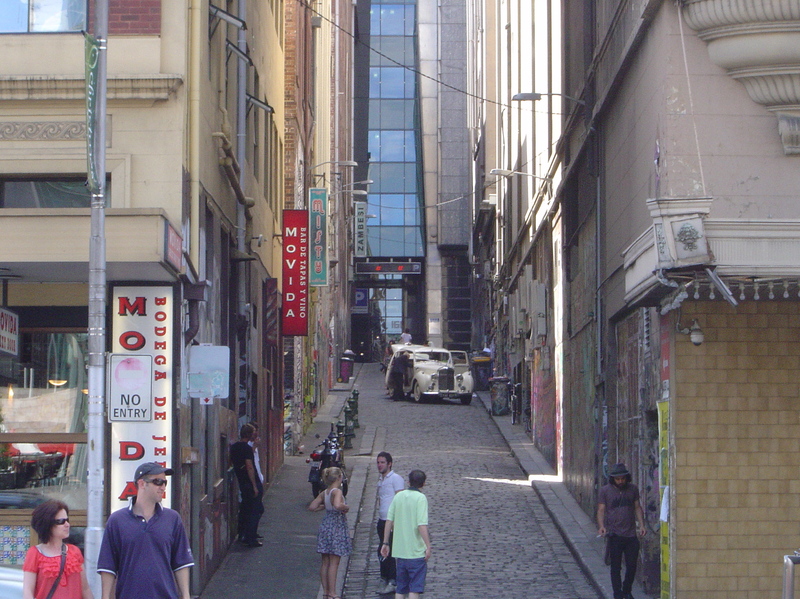 The urban regeneration of Melbourne’s inner city service lanes has opened the areas up to bars, art galleries and other businesses. The street artists and the developers are both looking for the same things: desolate former industrial areas in city centres. Melbourne’s graffiti filled lanes look attractive, or maybe that was because of all the attractive young women hanging out there on a Friday evening taking photographs of each other. “If these wall could talk they’d say ‘Thank You’” read one stencil in Hosier Lane. The anecdotal claims of graffiti being a symptom of crime and urban decline does not account for the contrary evidence. Anti-graffiti politicians use anecdotal claims to point to graffiti as an indicator of crime but this fear campaigns by politicians (and the industry of graffiti removal) only repeat the slanderous claims of an association of graffiti, crime and urban degeneration. Is this a case of blaming what you can change rather than pointlessly blaming the actual but uncontrollable causes? And what are they proposing as an alternative to the threat of graffiti – more advertising space or more buffing is not going to make a city more attractive. In London I saw a sign warning that this wall has been painted with anti-graffiti paint along with lots of ugly black lumpy anti-graffiti paint. There is lots of grey paint buffing graffiti along the train lines around North Melbourne. The ugly paint does not remind me of urban regeneration. Or is it selling a dream of some ideal utopia that can never be realized? I am not an expert, an urban planner or criminologist, but it is clear that there is far from conclusive evidence for the claim that graffiti is an indicator of urban decay. A survey with a greater geographic and longitudinal view of street art and graffiti is clearly required to determine anything about the impact of graffiti on the urban environment. This entry was posted on Wednesday, September 7th, 2011 at 4:38 PM	and tagged with graffiti, Hosier Lane, Melbourne, New York, urban decay, urban renewal and posted in Culture Notes, Street Art. You can follow any responses to this entry through the RSS 2.0 feed. I see street art as a reaction against urban decay. As an anecdotal example, there was an ugly wall near my house, with peeling paint and tags, so I painted a mural over it. Somebody had to fix it and the owners weren’t going to do it. It makes sense that street art and urban decay appear together, but the causal relationship in the minds of many politicians is backwards; street art doesn’t cause urban decay. It’s about individual citizens trying to rejuvenate their city in areas where the cultural hegemony has failed. It is not surprising that people often have problems understanding cause and effect relationships as there are lots of fallacious reasoning about causation, like post hoc ergo hoc (“after it therefore because of it”). There are also assumptions about the types of causation that occur, for example, that only governments or property owners can act in a responsible manner and improve the city and that individuals are either obedient or disobedient in this program.